at the Star Knowledge Conference. [Editor's Notes: A funny thing happened during the interview with Standing Elk, we sat down and started to do the interview, and I noticed that the tape had stopped. So I put in new batteries into the tape recorder and started on a new tape and the second attempt the interview was fine. During the interview, I felt like a cone of energy around both of us and felt myself getting light headed. Since I am sensitive to energy, this is something that does happen to me from time to time when speaking with certain individuals. My theory about this type of experience is that an energy field is being placed around us so that no one else can hear or interfer in the process. Secondly, it seems to me when such an experience does occur, it is almost like a planned event. What I mean by this, is the interaction of the two people's energy unlock some type of inner program that is held in the sub-conscious and was choosen before being born onto the Earth. Then at this exact time and place with the individuals involved, spontanously the inner programs or knowledge placed there becomes unlocked. J: Standing Elk, you have another name I have heard people call you, which name should we use for this interview? S: Well that other name is my English name but Spirit told me to go by Standing Elk. J: OK, Standing Elk it is. How do you feel about the conference, now that this is the last day. Do you feel that the conference accomplished your vision or dream or your intention? J: Was there any resistance from the Native Americans Elders and Brothers (and Sisters) to participate in this conference and share some of their knowledge, their teachings or informations they have about UFOs? S: I have had a lot of pressure, and its not pressure, its you could say its concern from my tribal members, concern from every tribe in the state of the South Dakota. Simply because the concern was based around a lie that had been told in what we call our local media, in our national media and this was just a diversion which was created to draw people away from the conference and the diversion was on me. I have had attempts already on my life, which I accept because that's what goes with this work, I have had physical attempts. But it has to go on. This area is a very touchy situation and people don't want this information to get out. But it has to go, it has to get out. Right at this moment, the people on the outside of my reservation, our local native people, I am not saying all of them, but a good majority or maybe a minority of them feel this is wrong. They feel that we shouldn't share anything with the white man, or we shouldn't share anything to the law(?) man. And all of this is based on fear and based on historical events which they keep within their DNA. So it is very hard for them to give something away, knowing that it can be misused, that it can be misinterpreted, it can be misconstrued into something that it is not. But the problem was that the miscontrution or misconceptions came from our own people. So anyway it is good. The misconceptions, I take that back. The misconceptions came from a lie, from two man I would say. A journalist and another man who is totally against us. And the statements that they used were totally false. And one that stated that I said certain things which wasn't said and that I was selling the secrets which is not true and selling ceremonies which is not true. So these are just diversions to keep us away and to keep the major public away from the sharing of the Star Knowledge with the nations. I believe that there is much more to come but I accepted that responsibility. J: Is there any UFO experiences that you have personally had that you would like to share with others, so they can better understand why you felt this conference was important to share specific information? S: Yes, my experiences started with the Star People when I was about three years old with a man that kept visiting with me every night who was circled with blue. I could never see his face, it was like what you would call blank. What he gave to me was just a knowledge or understanding that there was something there. I had no fear. He would come and knock on my window every night and show himself. Then there were many visitations at certain times, there were many lights that many of us witnessed that showed us that there was an intelligence. I had ball of lights, like fire but not fire, balls of light so condensed that they would cast no shadow coming in my room and were moving around. Also I had meditations with the Greys, meditations with the Pleidians, who are more like us. Also there was some contact with people that look like Praying Mantis like and some people that look like lizard and snakes. J: Standing Elk, the Conference that were having here  do you feel that weve accomplished the goals that were set out for the purpose of the Conference? Are you happy with the results? J: So would you say, Grandpa Standing Elk, was there a lot of humor and laughing at your Conference here this week? S: You know, humor is one of the most. . . its a very powerful medicine  laughter. Because laughter produces tears, and it produces healing in the body, and it can cure any sickness -- any terminal illness can be cured with laughter. It can be cured without the use of many of the medical technologies we have. Its a natural cure for many illnesses. Laughter is used as a medicine and its taken lightly throughout the United States. We always hear that laughter is the best medicine, and thats what it is. Its close to love, because when theres love theres also tears. When theres sadness there is tears, when there is happiness there is tears. So, humor is a very powerful medicine because its a Universal medicine that everybody should utilize at some point in their lives. J: Can you discuss your contacts with the extraterrestrials that you had? As you mentioned in your opening speech, you had some contact which gave you an awareness that we have Star Friends that are here and visiting us? S: Well, first of all I have to tell you that anybody that has contact with any extraterrestrials is violating the Federal Code of Regulations. And, if I was to tell you that I did then I would be setting myself up for a possible abduction from the National Security Agency and NASA, to be quarantined for a period up to five years or so, without any court available for me. All my rights would be taken away, and I could just disappear off the face of the Earth. So, Im looking at this and maybe if I could stand with ten million other people on this planet, on this United States, to say Yes we have, then I dont think theres a facility in the United States that could hold all these people, and where the Government could feed everybody or even draw up enough volunteers that would help to feed and take care of all the prisoners. 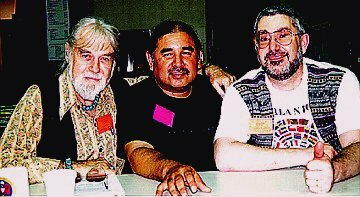 J: How well has it been working at the conference between the so-called UFO Speakers and Researchers working with the Native-American speakers? Is there a cooperation, an openness thats happening here? S: Well, first of all theres a big difference, theres a positive way of seeing things and theres a negative way of seeing things. Most Native Americans dont use the terms aliens, ETs, extraterrestrials, or EBEs. They dont have that term, because it creates a negative energy, and a negative force and a negative frequency within the system of Man or Woman. It creates a fear of not knowing anything. So when theres that fear there then theres an obstacle thats placed within your spiritual system that you cannot go beyond. So we dont use those terms. We have respectful terms for these people. Theyre relatives. Theyre family. Theyre teachers. Theyve been here. Theyre our future, theyre our past, theyre our present. Theyve been here. Every race has the legends from the Star Nations. And we cannot hide the fact that theyre part of our blood. Theyre part of our DNA. Theyre part of our genetic makeup. Theyre part of our metabolism. So, its there, and a lot of our spiritual people wont see it that way because their spirit holds different because theres a lot of respect for the nations of the stars. Theres not just the Orions, or the Greys, or the Reptilians, or the Pleidians, the Draconians, the Sasquatch  theres many, many, many other races out there, where some just are light, some are just matter, some are form places that we cannot comprehend. So, theres a lot of dimensions that we cannot even comprehend at all because of our limitations to three dimensions. We have Star People with 220 dimensions or more, so that tells you that we have a problem, because we cannot even identify and get straight with our own, little three. J: You said that you were familiar with this creature that theyve been reporting in Puerto Rico and Mexico (the Chupacabra). You had some interesting comments about that (in our first attempt at this interview), that you had a telepathic communication from one? S: This creature, from what hes shown of himself to me, has big eyes, red when Ive seen them, I dont know what color they really are. Green, not scaly, kind of a lizardy skin type. But, he was lonesome, and you could look at anybodys eyes, and the eyes have a language. You could look at a child and you could see if theyre hurt. You could feel people if theyre sad, you could feel them if theyre happy. So the eyes will tell you, because they say that the body lies, the mind lies, the ear lies, the nose lies, the tongue lies, your mouth lies, but your eyes. . . they never lie. So when I looked at the eyes of this, this man, creature, thing  the Spirit called him a thing. He was lonesome, and the reason why he was lonesome is because somebody left him here. Some other tribe or race of Star People had brought him here and left him, and he wanted to go home. He is carnivorous, but he is not as violent as our carnivorous people or animals are on this Earth. He has a different way of appetite. And the way they showed me was that he likes blood, and he likes liver, and his tongue is almost like a straw, where its a probing type system, very strong and pliable yet very soft. He wants to go home because hes hungry. He has nothing to eat so he picks on sheep, dogs, chickens and cats  small animals. So, what happened is the Pleideian people told me that they would take the responsibility of taking him home. Said he might get spiked up but well do that. So in the full moon of July, they said that would be the time to take him back. And we have to go down to Puerto Rico to do that, but that would be up to the people of the surrounding area. And the Star People said that we need their help, and while were there we could call them and their energies we could use as assistance for taking this little, carnivorous thing back to where it came from. J: Of the family thats visiting us from the stars, are there some here that are not here for the benefit of humanity? S: The ones that are not here for the benefit of humanity are not working with the people that are doing good for humanity. Now, those people have already been utilized. Theyve already created the damage, and theyre still being utilized. But, theyre changing their minds because whats taking place with the shift, its gonna affect them also. Now from what my intuitions and from what my understanding and my spirit and everything that I know and feel is saying is that this shift that is taking place is gonna affect not only us but them, so the only way that they could survive because of their energies, is that they have to change with that shift, and they got to make a positive change also. So, some of the Greys that came had some very powerful messages  they didnt come to kill, they didnt come to take anything. . . they came to give. The only way that they could survive is to teach harmony and teach balance, brotherhood and love. So theyre making this transition with this change, and some people dont like that  they dont like that. So what theyre doing is theyre putting out propaganda on these little grey people to make people say Dont listen to them theyre bad, when its not that, its not that at all, because some of the abductions have clearly defined human beings that are involved and stand and work with the Greys. The Greys, the smallest, are just droids  theyre human robots or organic robots. Its hard to visualize or even to think about, but they have no spirit. They have no spirit at all. They just act as one mind, just like clicking a button, a remote button with ten-thousand Sony TVs and they all work at once. So thats just the kind of concept to use with these small, grey people. But theres a lot of them that are good, and theyve never lied to me yet. The things that they told me Ive witnessed, and the things that theyve shown me Ive seen, so I havent seen anything bad yet. But I feel that those that are in contact with them are being investigated, theyre being wiretapped, theyre being sabotaged, because they dont want these Greys to tell the people whats going on, what the truth is. J: What are the aspects of the Conference that you felt were sharing some important messages or were highlights for you personally? S: I feel the highlights is not the abductions, or contacts, or the crop circles, or anything. I think the highlights is the sharing of the spirituality, and the sharing of the prophecy coming from the Red Man. We have many Red people, medicine men or common men that have come forth and were given some of the prophecy, a taste of the drop of prophecy, to the people to see what theyll do with this. Now, theyre instructed to give them just a taste, because if you were to give people the truth, a lot of the truth is twisted, and its turned into things that are not the way they are. So the Medicine Men, they understand this, theyre not fools as to give out all the secrets of the Universe or the secrets of the Spirit. Theyre not into that. They only give out what the Spirit tells them to give out. We were warned not to give out this prophecy yet, because the people would twist it. And, if they twist it then its not gonna go to the people that really need this truth: the innocent. So, everybody needs to come together, everybody needs to think about this, that a little drop of truth is whats put out, and were gonna wait and see what comes from it. So if it gets on the Internet, good, then were gonna find out whats going on, who believes what, where do the people stand with it. And if they twist it, then our spiritual people are stepping back, because they dont have time for that. The reason being is that you look at the history of the major catastrophes and changes of Mother Earth, the spiritual people were given messages, and the messages in turn were given and delivered to the people, and the majority of the people didnt take it, they said Oh thank you, thats a beautiful message and they left. So, just the people that were given the message usually survived the catastrophes. So, the spiritual people say Why tell it if theyre not gonna listen?, but we will give them a drop  if they listen we will share the rest. So, I was given the prophecy from the Hopi, and many of the Hopi people will not agree with this, or maybe not even accept or maybe will reject and say No, you dont have that, but I do. I was given the prophecy by the Mayans, because they told me it was written in the stars, and that if they were to talk about this down in South America then their tongues would be cut out or they would be killed. So they gave me that prophecy. I was told of the prophecy by some of our Lakota medicine men, who told me that I would be the first to hear of these prophecies. What I did in order to protect myself and to protect the message, I took this prophecy out and gave it to four other men and told them to keep it. If something happens to me, then at least this prophecy will be in their minds, and in their hands. It was given to men that my family doesnt even know, but Ive trusted with all my heart and spirit that theyre gonna keep. Its a good message, but its very powerful and very scary, because the people are in slavery, and they dont know how to get out of it. Theyre enjoying their spiritual slavery, their mental slavery, their emotional slavery, and their physical slaveries. That slavery is not helping them to actually look inside themselves. Theyre surface people. But there are many people that are actually trying to break that, because the society that we live in isnt working for them. The structure of the time isnt working. When the lunar calendar is broken then we can move with spirit, we can move with intuition and ESP and well always be on time at all times. But this other way, were in slavery, with the moon calendar. J: The Dakota people have legends that they come from the stars  is this correct? S: Theres a legend of what they call the Falling Star Boy, and Im not gonna go into this because itll go on and on and on and its gonna run this tape out, and its gonna run these batteries down. But it does go back into the Seven Little Sisters called the Pleiades, and it goes into the Eyes of God which are the seven original stars in the Universe. So the story is a very, very long story and Im sure that every other race has their story, but we do come from the stars. Theres many ways to look at it. In a national security sense, you could take it in a different way. In an academic sense you could say, Yeah, were stardust. In an educational sense we could take it the same way. But in a spiritual sense its different, its very, very different, and it deals with spirit. So, you can take it however you want to, but we do come from the stars. If we were living out in the Universe and we looked at Planet Earth, then everybody on Planet Earth would be Starmen, so we are Star People living on Planet Earth. J: What do you think the next step is after this Conference? S: We gotta continue on, keep digging for the truth, keep praying for the truth, because we cant hesitate to look for the truth. We can't rest to look for the truth. They say that its out there, but its not out there at all. You carry the truth within you. Any answer that you have, you have that inside. You go out and look for answers on the outside, you talk to people like me, you talk to people like [Richard] Boylan, and [John] Mack, people that dont have the answers that youre looking for  you have them inside. Theyre built into your DNA, theyre built into your remembering system. Theyre built into your own library, thats all within you. Its not out there, its within you. J: It seems that almost every Native American that Ive heard speak recently within the last few years, each person seems to be agreeing that the prophecies of the Mother Earth changing is now locked in, is an absolute, that this is what the Mother Earth needs to do to move forward into a new vibration. Is there any comments that you have about this? Is this something that could be changed, or are we now into the time of purification? S: Mother Earth is gonna change. Shes gonna wake up and shake herself, and when she does that, theres gonna be earthly changes. Her bloods gonna flow, and when her blood flows theres gonna be a purification by fire, a purification of earth, and water. The Spirit has said there will be land where there was never land and water where there was never water. So, that sounds like catastrophes are coming in place, but what I would like for people to do is to pay attention to their own dreams, because if you look at simple little stories like Noahs Ark, Sodom and Gamorrah, other stories that you know of where the Spirit had led certain people to certain areas for their own safety because of a catastrophe that was coming. Do that. Pay attention. When that time comes and the Spirit tells you to move, you move! Dont worry about your personal belongings because theyre not gonna do you any good, when theres no electricity. Dont worry about your computers, we wont have any electricity to run them off of. Dont worry about anything  just grab your families and go to the place where your spirit has guided you. So dont be afraid to follow your spirit  learn to work with your spirit, learn to work with yourself as a human being. J: I just have one more question and then well finish. Id like to get clarification about your vision for the Conference. If you can share how this came about or what directed you to feeling so strongly to put forth your call to have such an event? S: My vision was just like everybody elses. I was in a room with one of my brother friends, his name was Floyd Hand. In the dream I told Floyd that its time to teach, so he turned around to me and said About what?. So I said, About the Star Nations, and the Star Knowledge. So in the dream he kind of put his head down, then he looked up at me and he said, Yes, youre right  its time to teach. So in that dream, we both stood up and walked out the door. Then I woke up. But, the feeling and emotion that was attached to the dream made me start asking different interpreters and different medicine men and pipe carriers and those that carry the ways of the stars to come and help. This world needs help. People are afraid to help. But theres no need, cause were gonna die anyway  dont be afraid, just get up and help! Whatever it takes to save the seven generations, whatever it takes to save grandchildren and children, to stand up and fight for this Earth, for this Mother Earth. Because this Mother Earth is the only place that we have. Its the only home we have. Weve got to take care of her. Weve got to nourish her, because shes nourished us. Weve gotta stop contaminating the air and polluting the waters. Weve gotta stop what weve been doing, because she can only give so much, then after that we have to pay the karma for the human being. So, this conference is based around the dreams and the prophecies that the Star People have given the Red Man. And its time to do it. Its time to do it, and we can not stop. Its for everybody. It belongs to everybody. The Universal Laws belong to the Universe, and that means everybody. The Spiritual Laws belong to everybody because everybody has spirit. So were gonna share these things with the world, because it belongs to them. This is all part of a dream that is gonna materialize, or it has materialized. It has been prophesized by many others besides myself, so I know that it has to be true and I know it is true. J: Thank you Standing Elk. God Bless You, and together we are with you. S: We have many more sacred Belly-Rubs. J: I look forward to them. That's for sure. To contact Stand Elk or to learn more about the next Star Knowledge Conference slated for 1997, please find his address below. Standing Elk, P.O. Box 262, Marty, SD 57361, USA.